Up until now, we've only seen the electric BMW i3 in concept car form and somewhat disguised with blue camo tape. Now, photographs of what is more than likely the production version have leaked onto the web. What do you think? The photos of the hyper-efficient city car showed up on Car Throttle and other sites this morning, although its official reveal isn't coming until the end of the month. The shots aren't exactly hi-res, but they do show that it will be remarkably close to the concept car version. It's a radical car for BMW in many ways, and not just in terms of its looks. It's a rear-wheel drive hatchback with a 170-horsepower electric motor mounted in the rear, and a 650-cc two-cylinder scooter engine is available as an option to serve as a "range extender." Early drives say owners can expect range of about 100 miles or more. Charge times, according to Car and Driver, will be about four or five hours on a 240-volt circuit. At a fast-charging 50 kW station, it hits 80 percent in about 30 minutes. That's not bad. Presumably, we'll get the full specs when it is officially revealed soon. You would do well to read what Chris Harris thinks of it after he drove one over at PistonHeads. 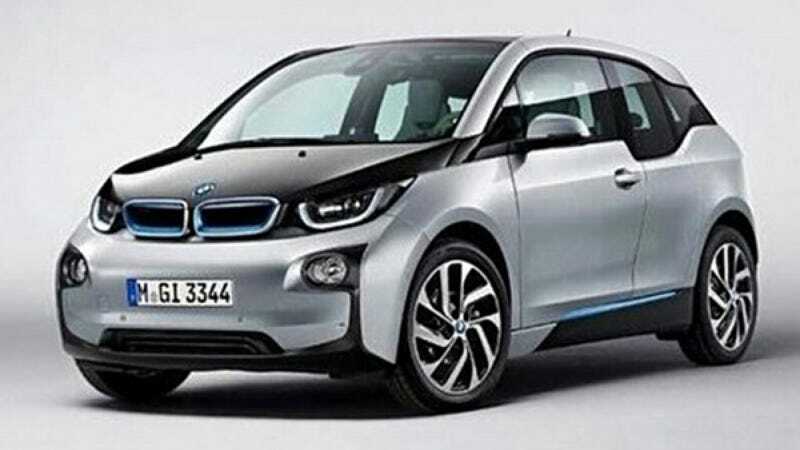 Until then, let us know what you think of BMW's foray into the electric world.